One of the biggest issues of our epoch, the idea of human-caused climate change, has caused millions of people to fight for change in government policy all over the world; most of the supporters are ordinary citizens who realized that something was wrong. Until recently, most politicians considered it untrue (and some still do, including George W. Bush), but now most use it to persuade people to vote for them--the candidate who is considered the most green has a bigger chance of being voted in. The number of people who don’t believe in human caused climate change is becoming less and less each day. In my opinion, if it hadn’t been for probable cheating in the 2004 election, Al Gore might have been elected president of the United States: He is very pro-environmental protection. Scientists first stated that they had detected a clear sign of “global warming” during an Intergovernmental Panel on Climate Change (IPCC) meeting. Thomas Karl led a team at the National Climatic Data Center in Asheville, N.C. to combine data of extremes of weather collected since 1910 to form a Climate Response Index. The frequency of natural disasters is rising, sea levels are rising, and according to some people things could get worse. All this is blamed on increases in carbon dioxide in the atmosphere, which is in turn blamed on human’s carbon dioxide emissions--but is it all caused by our CO2 emissions? People who disagree with the global warming issue are supposedly those who want to make money, if they are big corporations, or are in the pay of a big corporation, if they are scientists. Most people who fight for change are just ordinary people and don’t really know much about climatology, causing them to treat people badly who believe that man-made global warming isn’t true. They say that people who don't believe global warming exists don’t care what might happen to their children’s children, that they are fine letting the earth go to ruin as long as they don’t have to worry about it. But they may only say these things because it's what everyone else is saying. In scientific circles no one “attacks” anyone because of what they believe, but since the idea of anthropogenic (man-made) global warming came along, scientists who publicly oppose the whole idea have come under attack from other scientists, and it's becoming increasingly difficult for them to get funding. One newspaper editor said: "If a biologist submits a request for funds for the nut gathering habits of squirrels it would likely be denied but if it is presented as a study on the nut gathering habits of squirrels in correlation with global warming the funding magically appears." Quite a few of the opponents of anthropogenic global warming are scientists, writers, editors or just ordinary people who were activists and have decided that anthropogenic global warming isn’t true and have changed sides. Today, more and more companies say they are eco-friendly to increase product sales, but the whole anthropogenic (or man-made) global warming idea is causing the first-world countries to put pressure on the third-world countries so that they won’t develop, seeing as that would “produce more CO2”. So if nothing is done to prove or disprove the theory of anthropogenic global warming, than the third worlders will continue to live the impoverished lives that live today. According to some scientists, this change in the climate is a natural cycle that has been happening ever since the dawn of time. 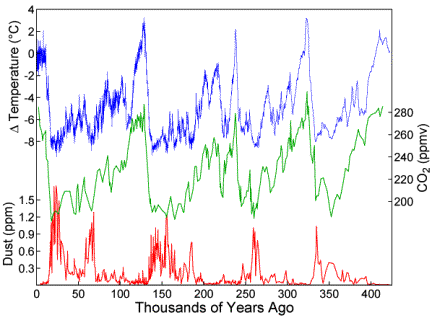 Look at all the hot and cold periods: the most recent ice age lasted three centuries starting in the 16th century, and at the time of the coldest period (around 1750) there was not really any human activity could have had an effect on the climate. Today, the climate is not warmer than previously: there are clues that during the Eocene epoch there was a subtropical climate at 77° N latitude (northern Canada and northern Russia) and it was only during the late Eocene that Antarctic glaciation was started. These circumstances show that during the Eocene the climate was quite a few degrees warmer than it is now. According to Al Gore, today is the warmest period in the last 650,000 years--but there were warmer periods under 150,000 years ago, under 350,000 years ago and a period as warm as today under 250,000 years ago. Today may be the “warmest” but only warmer than any year in the past 400 years. If you look at this graph showing temperatures, CO2 and dust taken from Vostok ice cores you will see that the high temperatures seems to repeat itself: this is what one calls, cyclic. The CO2 might correspond slightly with the temperature, but that doesn’t mean that high CO2 is the only cause of high temperatures. A recent study showed that earth’s temperature was more closely related to the sun’s output than to CO2. We could suppose that the CO2 was being released into the atmosphere by the increased temperatures caused by the sun’s output, thus looking like the CO2 was causing the rise in temperatures. Even if CO2 causes higher temperatures, that doesn’t mean we are causing it, nor does it mean we can do something about it. On Al Gore’s Web site, he states that more than a million species could be driven to extinction worldwide by 2050. One million species is between 22 percent and 50 percent of all species today which, compared with the end of the Palaeozoic when 96 percent of marine invertebrate and 75 percent of terrestrial species went extinct, or the end of the Mesozoic where 75 percent of all the marine and terrestrial species disappeared. Extinctions have been happening since the beginning of time; there is nothing unusual about it as long as it is related to the climate, but when humans are involved, I find that less normal. Of course, there will be territorial conflicts, but I am not saying that humans going out of their way to kill animals for their fur is a good thing to do. As for the rising sea levels I think the only thing that can be done is to build up the levees and other coastal defenses where possible. According to a report published in a newspaper: “to improve the defences it would cost around 3 to 9 billion dollars in the Netherlands and 6 to 7 billion in Great Britain” which, if compared with the cost of evacuation and damage caused if nothing is done, is a small amount. The loss of human life would not be too great if there is gradual rising of the oceans, but if there is a reservoir of water created in Greenland and it breaks, it could be disastrous. It will be also disastrous if the power of hurricanes increases as predicted by Al Gore and others. According to “The Great Global Warming Swindle," the reason that there are climatic extremes is because of the temperature difference between the poles and the equator, meaning that if there was a rise in temperatures (especially at the poles, where the increase in temperatures is supposed to be the highest) there would also be a drop in the amount and power of climatic extremes. This is explained in any textbook on the subject. The media has taken a surprisingly great interest in the whole issue, so much so that now people have expectations that cause the media to “make up” more and more extreme forecasts. The media seems to have arrived at a place it can’t back out of easily, not without losing a lot of popularity. Until about 6 months ago, I was very much pro-anthropogenic global warming: I was writing an essay on it and I had given a presentation to the mayor of my town on global warming. More recently, I found out that there was a good chance that the anthropogenic global warming theory was wrong. Whether anthropogenic global warming is true or false will eventually be decided, but as I said before about the developing countries, it’s now that we need to find out, not in few decades. I just encourage you to do what I am doing: find out for yourselves what is true and what is false before fighting for that cause.